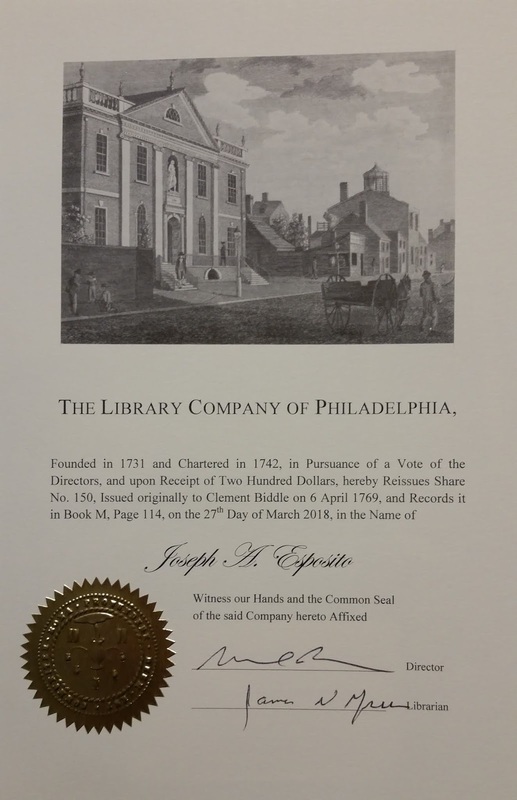 The Library Company of Philadelphia, a research library established by Benjamin Franklin in 1731, has a unique shareholder program in which supporters can purchase the original subscription which belonged to a member in the eighteenth or nineteenth century. I am a shareholder, and my share was originally owned by Clement Biddle. The share, number 150, was issued to Biddle on April 6, 1769. Biddle (1740-1814) fought in the Revolutionary War and was at the battles at Brandywine and Germantown in Pennsylvania and Monmouth in New Jersey. He eventually served the Pennsylvania militia as quartermaster general. He became Pennsylvania’s first United States Marshal in the new government. His share was subsequent owned by four other Biddles in the nineteenth and twentieth centuries, and then by Alexander D. Wainwright, a bibliophile and Princeton University librarian, whose share was acquired in 1969. Wainwright was an avid collector of Thomas Wolfe material. I have biographical information on all the previous shareholders. My share was issued on March 27, 2018. This is a fantastic fundraising program by a historic library and it is administered in a way that creates a connection with specific supporters from the past. I am delighted to be part of this effort and this library.